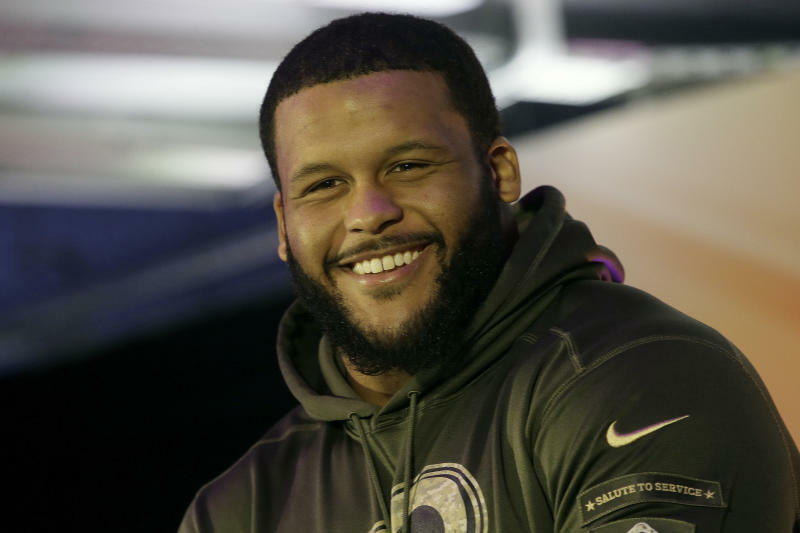 LOS ANGELES (AP) — Aaron Donald's two-year quest to become the NFL's highest-paid defensive player finally ended in success Friday morning. And just a few minutes after signing his deal, Donald was at work on the Los Angeles Rams' practice fields for the first time in months, determined to keep doing the same things that made him so very wealthy. "I feel good right now," Donald said. "To be back out here playing football again, that's what it is all about. Long process and a long wait. It was tough. Definitely it was tough for me, having a love for the game, having to push that to the side and handle the business side." 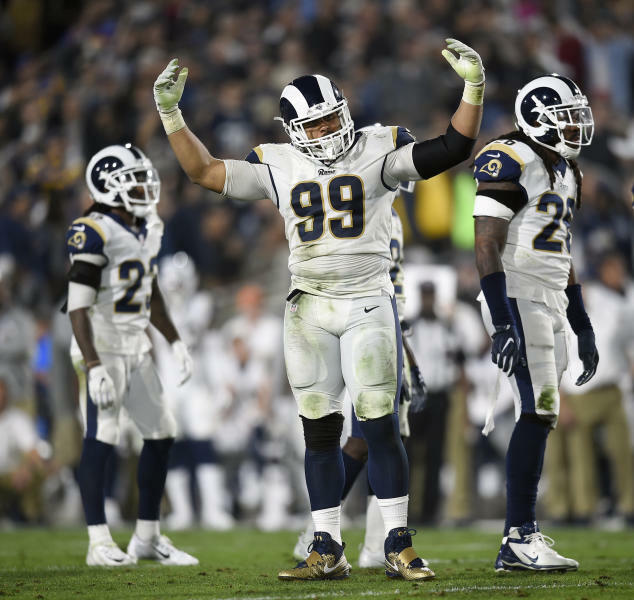 The reigning NFL Defensive Player of the Year is signed through 2024, and the Rams' defense can rest solidly on its cornerstone as Los Angeles attempts to capitalize on last season's success with a Super Bowl run. "It's a blessing," Donald said of his new deal, which surpasses Von Miller's contract in Denver as the new benchmark for defenders. "Growing up thinking about playing in the NFL, you never think that big, or expect something like that. But my dad told me since Day One, hard work pays off. I'm going to continue to work nonstop." After skipping the Rams' entire offseason program and training camp, Donald started work right away, even showing up at the Rams' training complex to sign his contract earlier than scheduled Friday morning. When he joined practice later, the Rams finally got to see Donald alongside newcomer Ndamukong Suh and veteran Michael Brockers on their potentially destructive defensive line. Earlier this week, Rams coach Sean McVay said Donald should be able to play in the Rams' Monday night regular-season opener in Oakland on Sept. 10 if he signed within the next few days. Donald has been working out at home in Pittsburgh during his holdout, and McVay checked in regularly with him. "I feel good, but I've still got to get in football mode, as far as pass rushing moves and just knocking the rust off a little bit," Donald said. "But that will come in a couple of days." The Rams managed to maintain a civil relationship with Donald throughout the two years of difficult negotiations. Donald and his representatives were determined to make him one of the NFL's highest-paid players at any position, but the Rams wanted to reward Donald while keeping their overall salary structure intact. "I don't think you were ever miles apart," Rams general manager Les Snead said. "Everybody with common sense knew Aaron Donald was, at minimum, going to be the highest-paid defensive player in football. From there, you had to figure it out." Since his rookie season in St. Louis as the 13th overall pick in the draft, the 27-year-old Pitt product has been one of the NFL's most dominant linemen with remarkable effectiveness against the run and the pass. The compact powerhouse was chosen for the Pro Bowl after each of his four seasons, and he was a key component of Los Angeles' extraordinary one-year turnaround under McVay in 2017. With Donald adapting quickly to new veteran coordinator Wade Phillips despite missing training camp, the Rams won their division for the first time since 2003 and ended the franchise's streaks of 13 consecutive non-winning seasons and 12 straight non-playoff seasons. Although Donald has 39 sacks in four NFL seasons, traditional statistics don't reflect the full measure of his disruptive play on the line. Phillips rhapsodizes about Donald's ability to force opposing offenses into bad decisions by his ability to wreck any blocking scheme with his low, ferocious charges through the line. But Donald also took a hard line in negotiating his football future: Along with his training camp holdouts, he also skipped the Rams' entire offseason program this year. He didn't report last year until the day before the regular-season opener, forcing him to miss the Rams' first game. He still was named the NFL's top defensive player despite playing in only 14 games, racking up 11 sacks and 41 tackles while forcing five fumbles for the NFC West champions. He also led the NFL with 91 quarterback pressures, according to Pro Football Focus. Donald now must learn how to play alongside Suh after the five-time Pro Bowl selection joined the Rams as a free agent in March. They'll work together on a revamped defense that also includes new cornerbacks Marcus Peters and Aqib Talib. "It's interesting, 'cause it's always been on paper, right?" Snead said. "Oh, Aaron Donald paired with Brockers and Suh and everyone else and the DBs. But to see him on the practice field now beside (Brockers), besides (Suh), with Aqib, you're like, 'OK, wait a minute. Here's what we set out to do.' And now you just look forward to going and playing a game." "They all made some sort of sacrifice for this moment," Snead said of Gurley, Cooks and Havenstein. "They didn't take less money. They just may have delayed some gratification, because we always said, 'We have this room in the budget and we need to save it, and this is the goal.'"